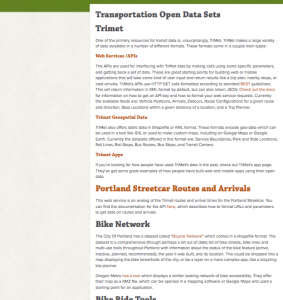 Home » Blog » Hacking for a better transportation future! 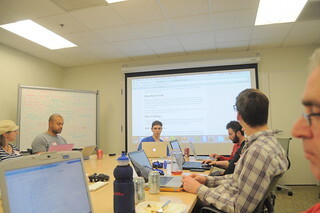 Hacking for a better transportation future! Last Saturday, 25 citizens generously forwent the sunny weekend weather for the greater good of transportation advocacy to attend our first-ever Avenues to Advocacy hackathon. 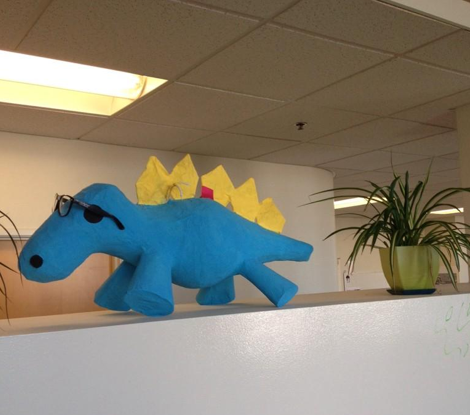 ESRI Portland R&D Center generously donated their downtown office – and it was an ideal spot – with not one, but two, indoor bike parking areas, an impressive collection of dinosaur toys adorning the office, and a refrigerator to make the Intel®: Leap ahead™ sound every time someone opened it. 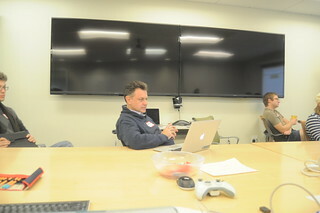 The hackathon got rolling at 10AM over bagels and coffee (thanks to our sponsors, Einstein Bagels, Nossa Familia, and New Seasons for the generous donations!). Each hacker introduced themselves by telling a story about their first bicycle experience before splitting up into groups of 5-10 based on interest in different focus areas of the website, with programming experience in each project group ranging from zero to master hacker. Luckily we worked with a Nationbuilder platform, which allowed our non-programmer folks to work on the website without having to dive into deep coding. Nationbuilder was chosen because it has the framework for 1) user-generated petitions, 2) group conversations and community editing, 3) integration with the national voter database, 4) integration with facebook/twitter, and other existing social media platforms that are approachable to non-technical folks. 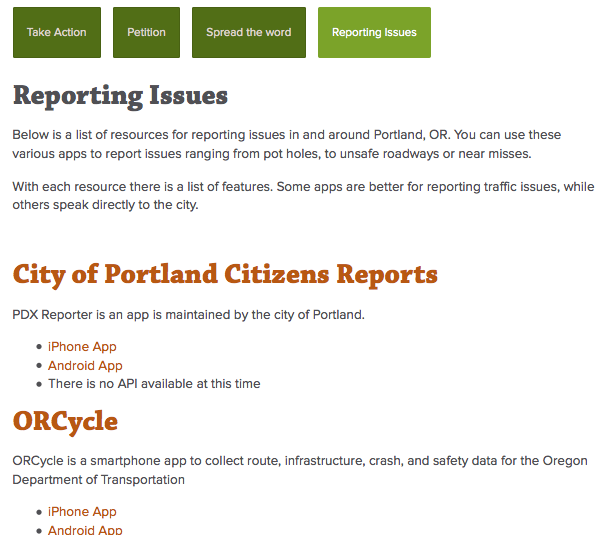 The Maps group: This group created a comprehensive list of different reporting map tools that can be used for transportation reporting. The Analytics group. This team, led Toby Fee of New Relic, installed back-end reporting mechanisms that would allow us to see demographics and performances of the website. 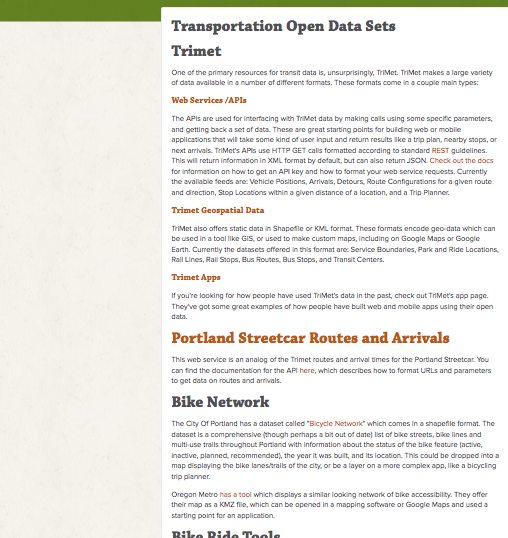 The “listicles” group created a number of comprehensive resource lists for Portland, including transportation education resources, a list of all transportation advocacy groups, a list and description for transportation acronyms, and a list of all transportation open data sets. Each list was formatted using microformatting standards, which will allow the lists to be machine readable for future web apps. The “calendar” group. This group, led by Mychal Tetteh and John Karabaic of New Relic, worked on designing a syndicated calendar for all transportation resources. They ended up trying out a number of technical solutions and ended up coming up with the solution in the final minutes using the code from Calagator, a locally-built event aggregator, after they had already demoed their work! They are now working on implementing it over the next few weeks. Get a behind-the-scenes look at all the groups’ progress in this brief video. Mid-day, our hungry hackers took a break in the afternoon for a tasty lunch spread, generously donated by Pine State Biscuits and Via Chicago Pizza. Turns out, Via Chicago has a vegan pizza that could make the most adamant carnivore weak in the knees. Nearly a quarter of attendees said that this was their first hackathon and many had never volunteered with the Community Cycling Center before! The event was a success, but the work on Avenues to Advocacy is by no means finished. Drop-in volunteer hacking nights are on the horizon before the release of the website in early 2015. Thank you again to Code for Portland for co-hosting, ESRI Portland for lending us their gorgeous office, Einstein Bros on NE Broadway, Nossa Familia, and New Seasons for breakfast, Pine State on NE Schuyler, and Via Chicago Pizza for lunch, and, of course, the lovely people that came out to help build the next generation of transportation advocacy. We couldn’t have done it without all of your help! You can find out more about the Avenues to Advocacy tool at the City of Portland Bicycle Lunch & Learn series on November 20th, when Lillian Karabaic will discuss the tool and demo the progress thus far!